Bob Kobie discussed the church’s current ﬁnancial situation and Pastor Joel gave a presentation on "Borrowing According to the Bible." The elders wanted to share some notes from that meeting to help you as you pray for our church, pray for the potential building project, and prayerfully consider your giving towards the church's general fund needs and building expansion fund. At the meeting, Bob discussed that the church is not in bad ﬁnancial state, but a concerning one, as our monthly cash balance [checking account balance) has been slowly depleting for the past 2 1/2 years. Below is a chart to help show you that sometime during 2015 our operational expenses began to exceed our annual General Fund giving, which has caused our cash balance to slowly decrease. Currently for 2018, the church’s income (giving) is about $7,000 less than the expenses so far for the year. Our current cash balance for 2018 is around $25,000. saying “pay your bills" more than it is saying not to borrow money. Other Biblical Principles (Phil 4:19, Heb. 13:56, James 4:13-17. and 2 Cor. borrowing money, however. after reading the Scriptures and hearing Pastor Joel’s explanation of these passages, we do not come to the conclusion that it is sinful to borrow money wisely. There are many warnings in Scripture about paying your debts and lending graciously, but none that forbid the process of borrowing. If the Bible lays out biblical principles and regulations for lending, someone has to be doing the borrowing. The elders have set before the congregation a couple of goals [which have regularly been in the bulletin this year). The first goal is to maintain the church's checking account balance at $50,000 or greater. We need to be able to pay for the church's current regular expenses, as well as a mortgage payment someday, if the church votes to wisely borrow money for the building project. The second goal is to raise $210,000 in the building expansion fund prior to bringing a building plan before the congregation for a vote. The church has already raised half of the $210,000 goal! Praise the Lord! A question was asked at the meeting as to how many giving units are giving toward the expenses of the church. Currently. there are 89 giving units. Below are some ﬁgures to help show how the checking balance could be affected by 89 giving units. Another item that was mentioned at the meeting was that the elder board plans to present a 2019 budget to the congregation during the fall meeting.- Typically we vote to approve a budget at the February meeting [for example, this year we voted in February 2018 to approve the 2018 budget). Part of the reason for this change is that the February meeting is typically a long meeting, and we hope this Change will shorten the February meeting. Also. the elders are hoping that this change will help with the budgeting process. Another part of the church‘s ﬁnanclal state is that the expenses (which should align closely with the budget) need to be less than or equal to the giving. 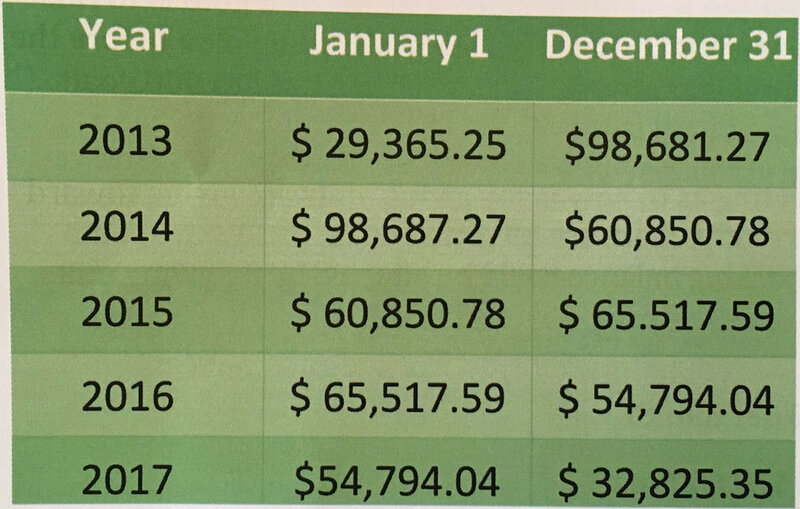 At the end of this letter, there are three charts, which were presented at the meeting, to show the church’s general fund income and expenses since 2015. To clarify. these charts, as well as the cash balance spreadsheet on the first page, do not include giving or spending involving the Building Expansion Fund. We have used the Building Expansion Fund significantly in recent years towards things like the land purchase and expanding the parking lot, and the giving towards those projects and the expense of the projects are not included in these figures. The elders' desire in this letter is to clearly present to the congregation the state of our finances. We hope this letter was helpful and encouraging and not confusing and discouraging. We are encouraged! We recognize that the cash balance has decreased for the past couple years. but we are hopeful that through expressing this concern to the body, as well as examining the budget closely this fall, that the Lord will provide. If you have questions or would like to discuss any of the Scriptures or financial data in this letter, please don’t hesitate to reach out to your elder, Pastor Scott or Pastor Joel. We are excited about what the Lord is doing! He has faithfully provided through this generous congregation, and we pray that you will continue to seek His will as you consider how to steward the resources the Lord has placed in your care as we continue to Cultivate Followers of Christ.